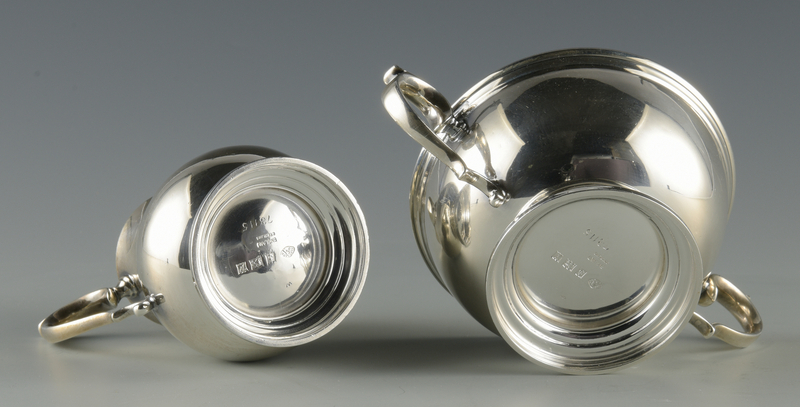 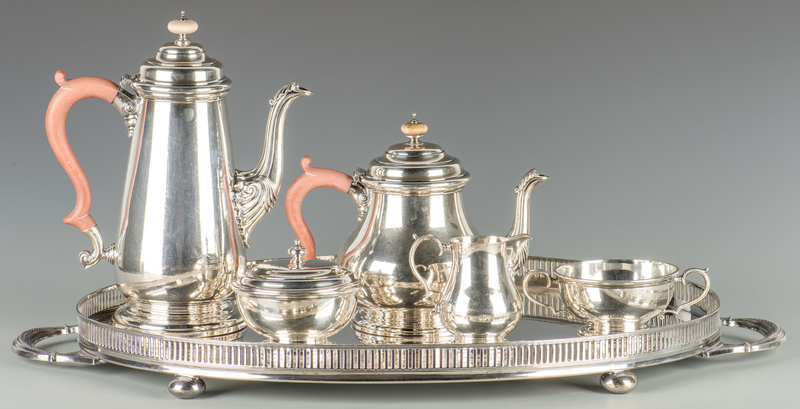 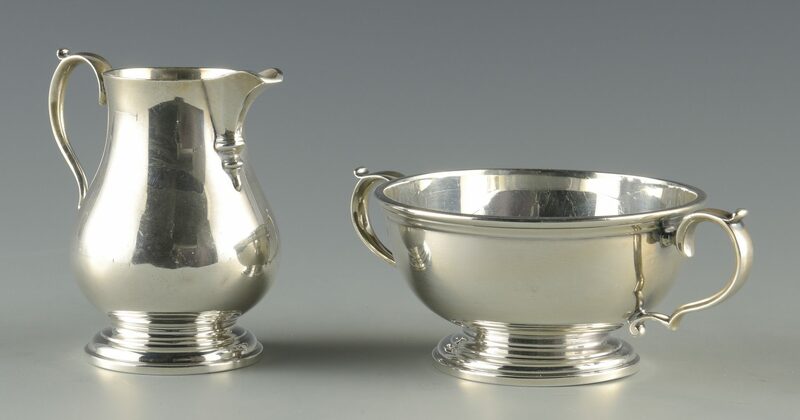 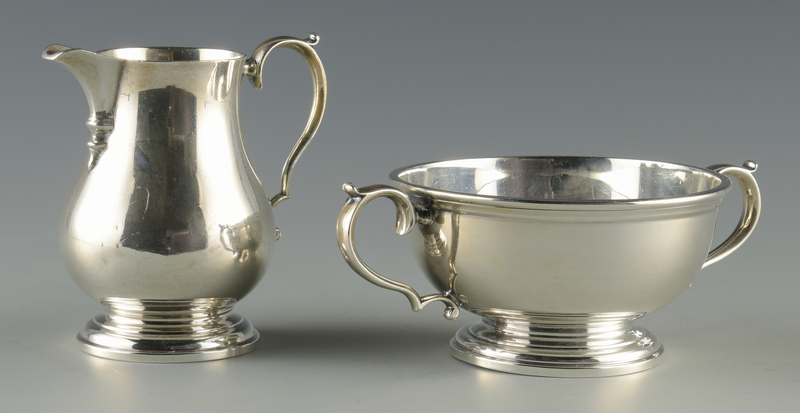 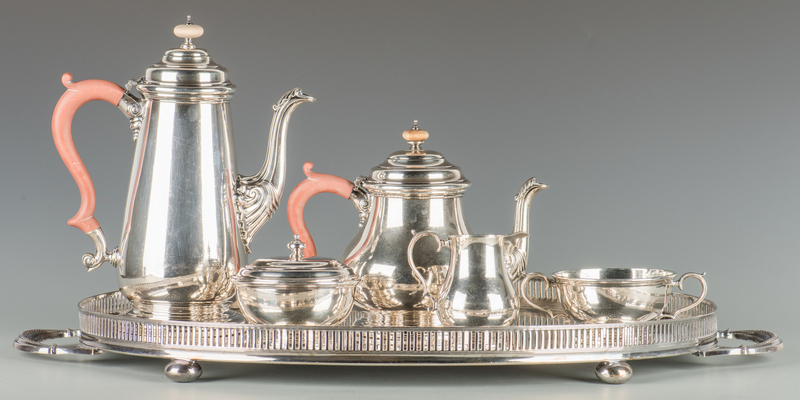 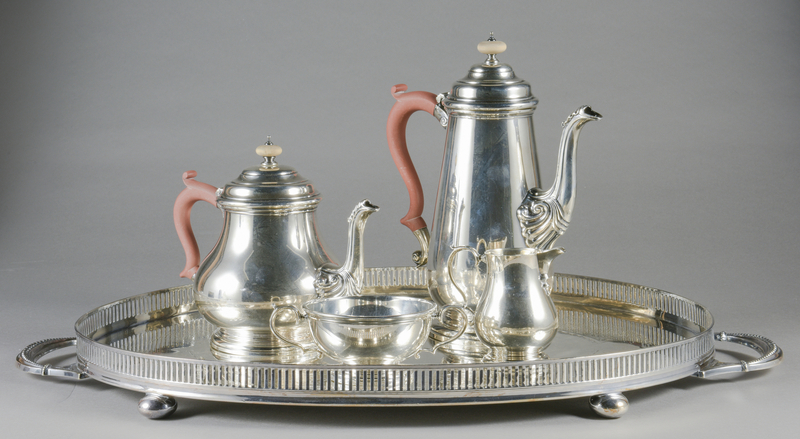 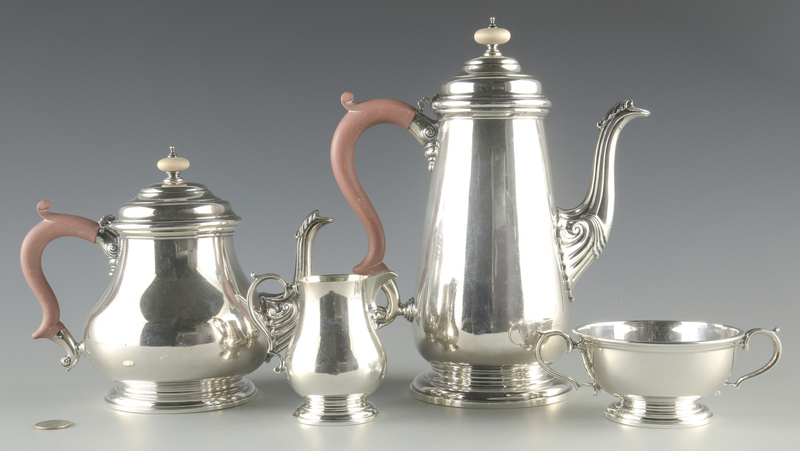 Lot 68: English Sterling Tea Service, Adie Bros.
You are here: Home >> 2017 01 21 Auction - Knoxville, TN >> Lot 68: English Sterling Tea Service, Adie Bros.
English 20th century sterling silver tea service in the George III style, including tea and coffee pots with wood handles and finials, sugar, creamer and waste bowl; hallmarks for Adie Brothers, Birmingham, England, 1952-1953, with apocryphal inscription to underside of coffee pot: "Period George III Circa 1781". 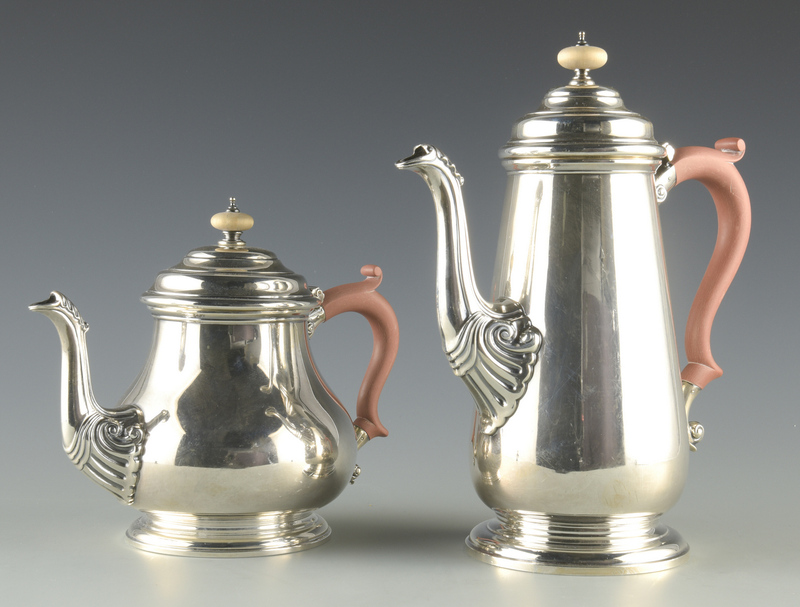 Pieces also marked "Made in England / Sterling." 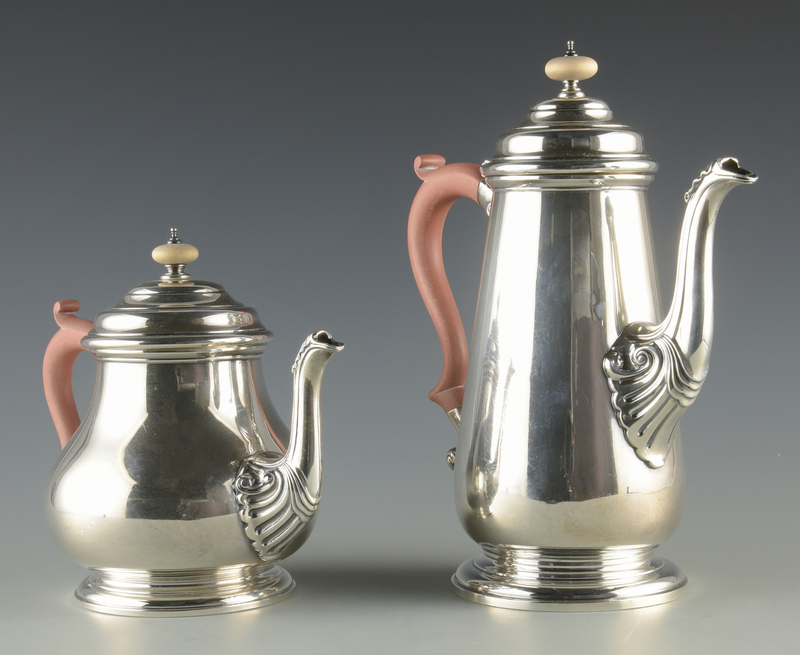 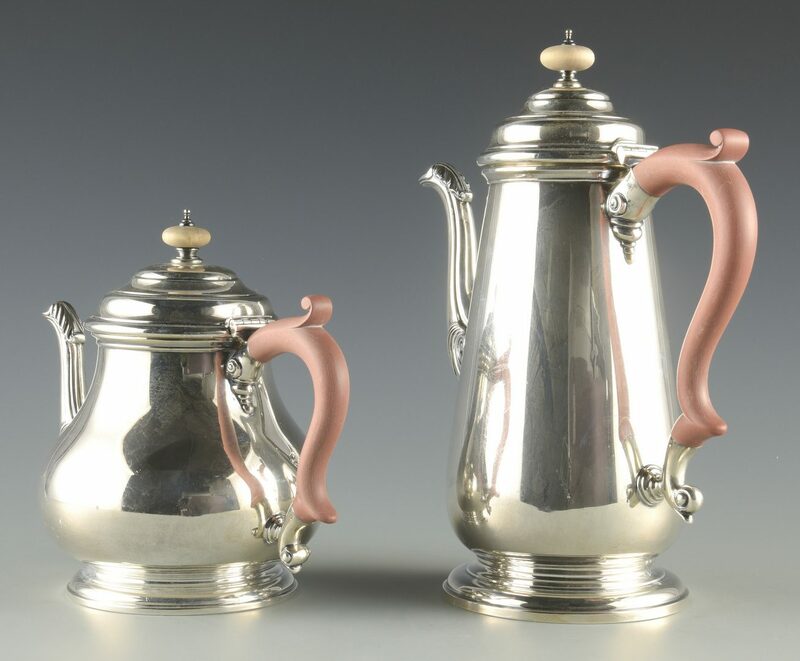 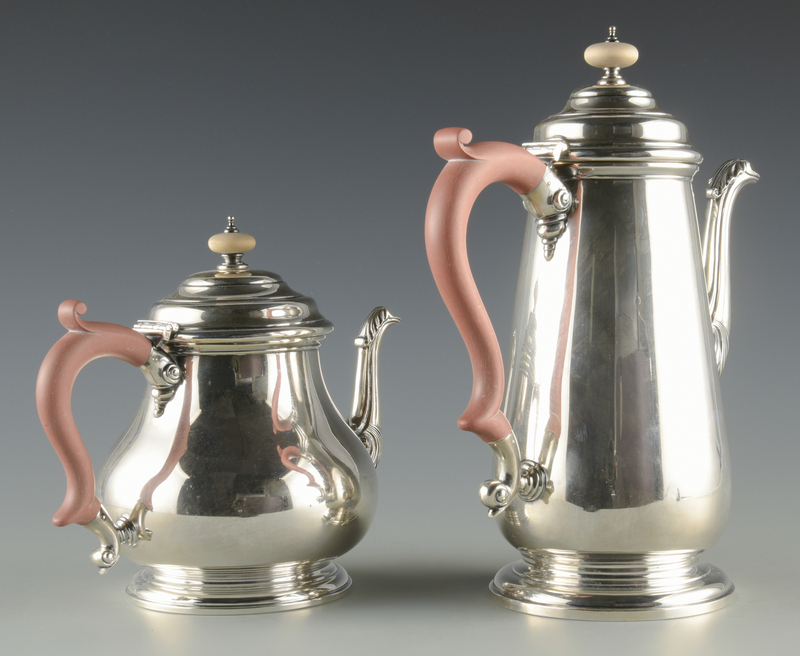 Coffee pot: 11" H. 73.055 total oz troy including finials and handles. 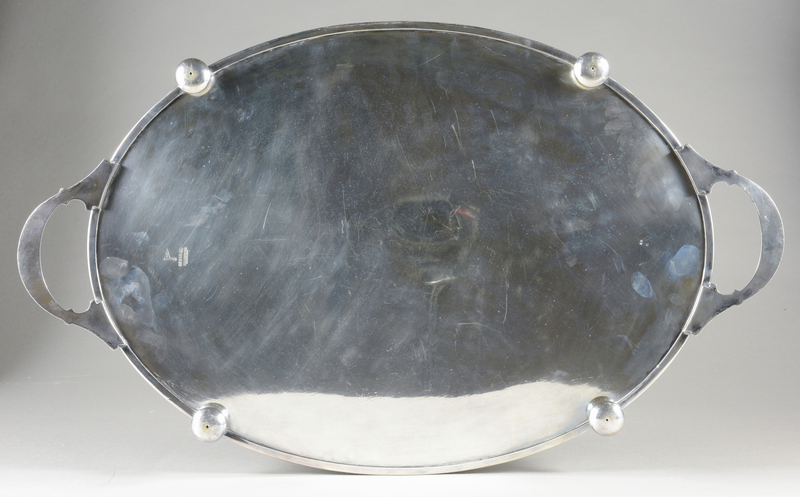 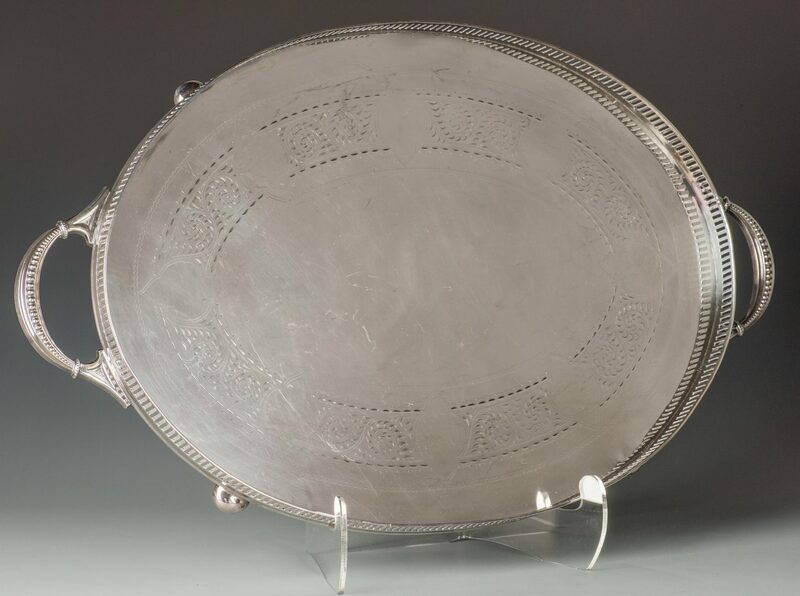 Includes an oval silverplated gallery tray with engraved anthemion design, marked Walker and Hall, Sheffield (England) A1. 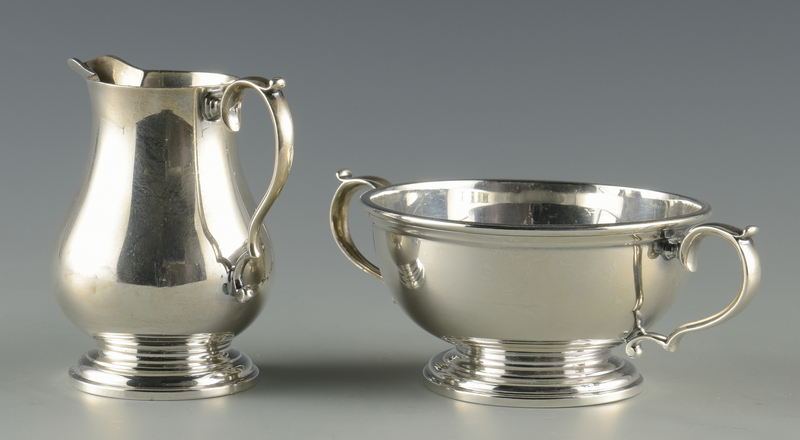 2 3/4" H x 27" W ( including handles) x 16" D. Provenance: Collection of Charles and Ann Wells, Nashville, Tennessee. 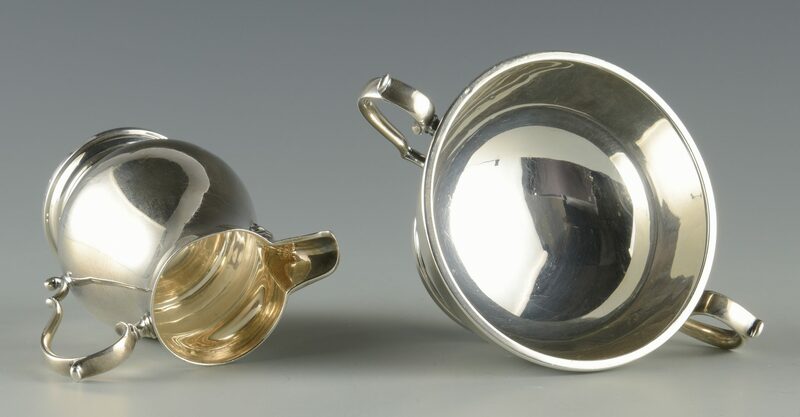 CONDITION: Overall good condition with scattered tiny minor dents and some abrasions/scratches, finial on coffee pot is loose.